It’s been ten years since the Lehman bankruptcy and a common perception is that in the aftermath of the financial crisis, innocent people suffered but the guilty CEOs and risk managers got away scot free. Impact on homeowners, shareholders, and the market place was tragic and lots of suffering resulted affecting households across the country. Especially hard hit were young adults just entering the workforce and those reaching retirement age. And everyone in the financial world, myself included, and anyone with a retirement account, a mortgage or a loan felt the stress and anxiety of wondering whether the entire economic system was on the verge of collapse. When communities suffer this much material and psychological trauma, it is natural to seek a release. So, we search for someone to blame and hold accountable, but often the actually guilty parties are not required to make us feel a little better, in the short term anyway. In a recent article, Andrew Ross Sorkin cited a comment from President Bill Clinton on the futility of offering up a sacrificial scapegoat to the public: “You could take Lloyd Blankfein (president of Goldman Sachs) into a dark alley and slit his throat. And it would satisfy them for about two days. Then the bloodlust would return.” What President Clinton understood was that the crowd wanted a scapegoat and even if they got what they wanted the calming effect would be short lived and the problem would remain unsolved. We see the search for a scapegoat continuing as bankers are vilified, CEOs demonized, and politicians suffer from too close association with Wall Street. A sacrificial scapegoat wouldn’t have made lives better or satisfied the public for long. Part of the reason the search for the culprit continues is that there was plenty of blame to go around. Wall Street behaved badly, CEOs were blinded by astronomical profits, and regulators turned a blind eye. But Main Street went a little bit crazy too over the lure of easy money from no interest, no money down loans. While only the big guys got bailed out, if they had been allowed to fail the average homeowner would have suffered much more as the banking crisis could have taken the entire economy down with it. So my suggestion is to stop searching for culprits and scapegoats and take a clear eyed look at what is required to avoid having to face a problem like this ever again. Dodd Frank is an attempt to regulate and legislate more stable markets to prevent a meltdown like this one, but it’s cumbersome and bureaucratic. I’d like to propose a simpler, better solution that has been effective not only for decades, but through many financial crises. It is the effectiveness of a third party, centrally cleared institution where trades are settled and guaranteed by the clearing house, not the counter-party. This is the way stocks, futures and options are currently traded and settled (and have been for decades) and even during the financial crises of 2008-9 there were no defaults of trades or bankruptcies of clearing houses. The dramatic problems of the crises came from the over-the-counter derivatives that were self-margined. When the markets were in meltdown mode the crisis was exacerbated by opaqueness of the self-margin institutions. It led to a domino effect of margin calls as each institution required more and more margin from its neighbor. An independent third party that can adjust margins as volatility increases is the solution. Every trade should be cleared through a central counterparty (CCP) and then the counter parties to a trade need only to meet the margin requirements of the CCP to know that their trades will be honored. This eliminates the “Too big to fail” problem because every trade is properly margined. The CCP has many unique and interesting features. The most significant is that it takes the margining and risk analysis out of the hands of the institutional trader and is governed by an independent party that has no stake in the outcome of the investment, just the solvency of the institution. The Options Clearing Corporation and the Chicago Mercantile Clearing are two of the organizations that have been successfully handling these margin situations for decades. They are both rated AAA and have stellar records of performance. Dealers who are active in the OTC market (read – make a lot of money from them) would argue that the trades are complex and setting up a CCP would be difficult and take a lot of time. If the regulators had started down this path ten years ago the solution would be at hand today. Another feature of the CCP that hasn’t received a lot of publicity is this: If a particular market and its corresponding CCP become stressed, the authorities can assure liquidity in the market by supporting the CCP. In this extreme situation the authorities don’t need to decide on the fate of individual institutions, just the fate of the CCPs. The individual institutions will survive based on their trades, not their political savvy. In an interview on the financial news channel, CNBC, this week, Hank Paulsen said “My biggest regret about the crises is that we were not able to explain it to Main Street. The perception is that we only wanted to save Wall St., but Wall St. is the heart of the financial system and if it did not survive the consequences would have been dire.” Paulsen went on to say that we saved the patient but did a very poor job of selling our solution to main street. I would argue that the big three, Paulsen, Bernanke and Geithner, did an amazing job stopping the run on the bank(s) and stabilizing the system. At the time, I gave them an A as each action they took calmed the markets and my nerves. Ten years later we can see the results of their interventions and so I’d have to bump their grade for their actions to an A+ and add another criterion: communication. So there, sorry big three, you get a big fat F. As for Main Street, we need to do a better job of pushing for solutions and letting go of our need to punish someone. As I imagine telling the tale of this crisis to my grandchildren ten, twenty, thirty years from now, I’d like to be able to tell them how we made the economy more stable for them and not how we sent some hot shot banker to jail. A CCP for every transaction is good for the markets, the future and our nerves. Let’s not let another ten years go by without implementing this necessary and proven solution. 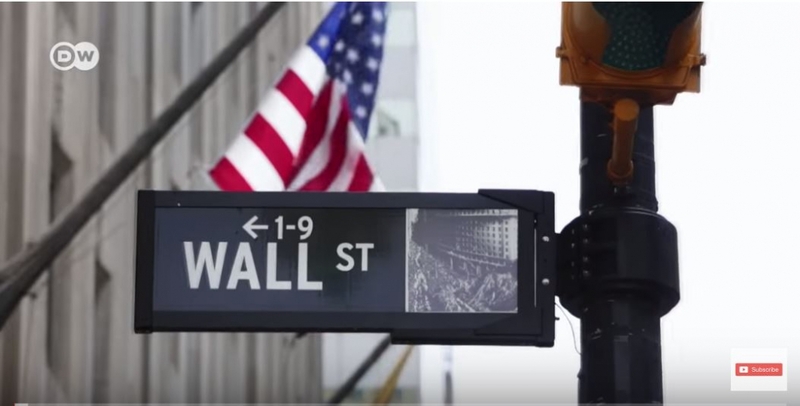 Image: Screenshot from Youtube: “The crash – the investment bank Lehman Brothers | DW Documentary,” by DW Documentary. Thanks Keith. I really appreciate the expert perspective you bring. It’s interesting how the inclusion of a third-party, the CCP, is structurally the inverse of excluding a scapegoat.